Today I set my personal record for ‘most expensive document scanned’. Not that I really keep track of that kind of stuff : ) But this was definitely a job to remember. They belonged to the owner of the famous Caleco’s restaurants here in St. Louis. They were original paintings by a famous painter named Aldo Luongo of the Kennedy brothers, and of some girl with a bicycle. The girl with the bicycle painting was AMAZING looking. I mean, local artists are always bringing in their prints and canvases to have PDF’s made of them, and their art always impresses me… but this girl with a bicycle painting was the most incredible thing I’ve ever seen in person. The way that this Aldo guy made all different colored messy paint strokes come together to make such a beautiful image amazed me. 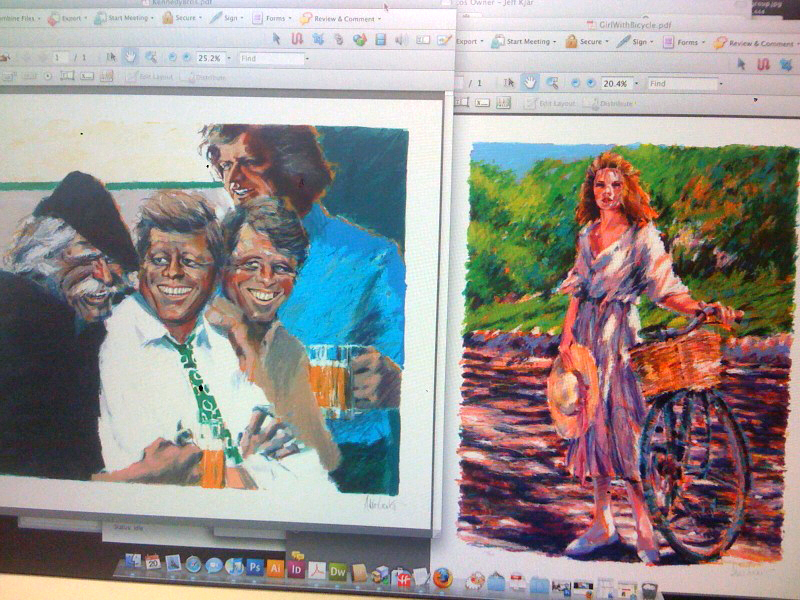 I scanned these paintings so that he could reproduce them and put them up in his restaurants. That way he doesn’t have to worry about someone throwing a beer bottle at them while they hang on the wall. If you have any pictures, or paintings/canvases that you would like to have ‘digitized’ (a digital copy of) BRING IT IN!!! It really doesn’t matter what size it is, or if it’s in a frame, or on a canvas. I can digitize it.